Firefox is very easy to set up for printing use in our system. 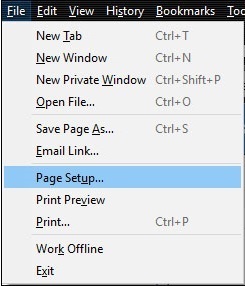 The first thing you will want to do is bring up the menu items for Firefox, so if you don't already see them at the top of your screen, hit your Alt key once, and they will pop up for you. You may periodically need to come back in here and make these settings again. Firefox periodically updates itself, and the updates, at least for now, reset this window to the defaults. You will know when this happens if you see extra space around what you are printing and extra information at the top and bottom of the print for things such as the web page URL, date and time, etc. "I set my default printer for Windows but whenever I print from Firefox it uses a different printer. How do I make it print from the one I want?" In the last step, you will go to your Cloud Based Point Of Sale system and print from the printer you want to be the default. Firefox will make that printer the default and fill in the blank in its settings. I have set my paper size properly in the printer driver, but whenever I print from Firefox it uses the wrong size! How can I set it to use the correct size? Next, enter the following in the Search area to get to the default printer setting for Firefox: print.printer (please note, this is different from the above command for default printer, print_printer, so they are easy to confuse). You will see a list of all printers used by Firefox. 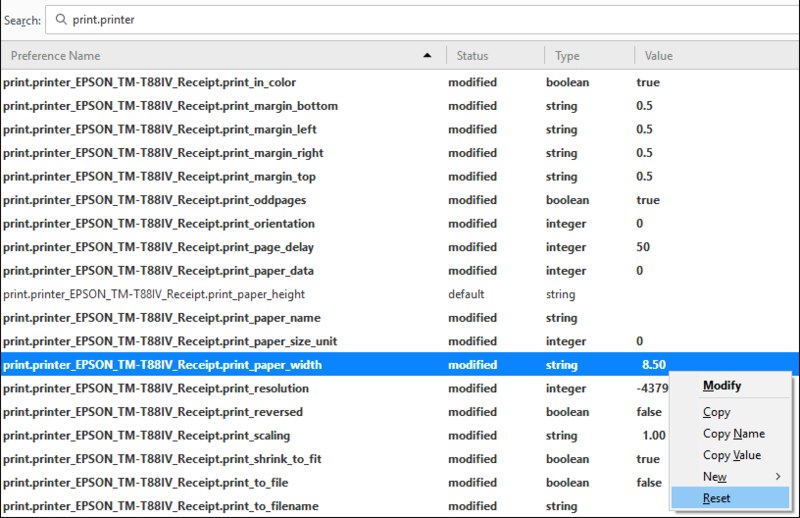 Scroll down until you find the exact model you want to work with for setting paper size. Please note that you may have multiple copies of the same printer, so you need to find the same exact one, for example, Epson T88 V copy 2 might be the one you actually prefer to print from. 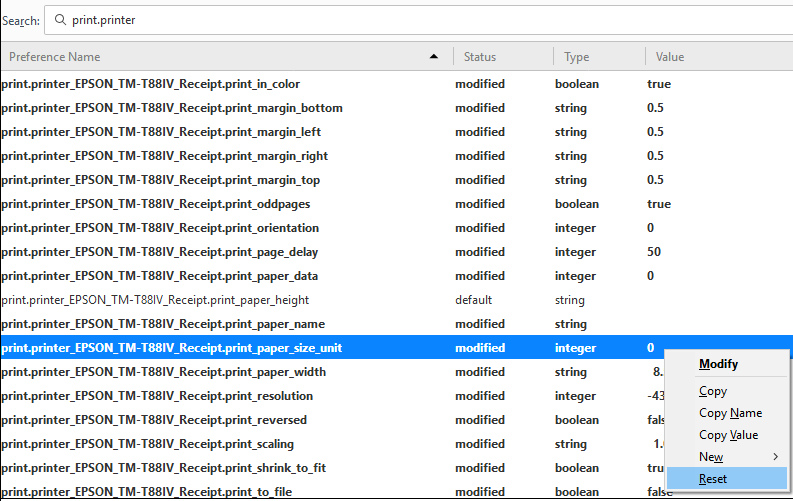 In the image above, you can see the three areas we will be resetting: paper height, paper width, and there is a chance you will want to reset your paper size unit. 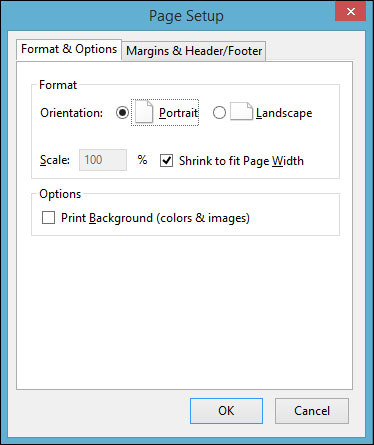 In the example above, our Epson printer uses millimeters instead of inches for paper size, but the settings are currently in inches. For paper_size_unit, the setting is currently at 0, which is for inches, so it will need to be reset. 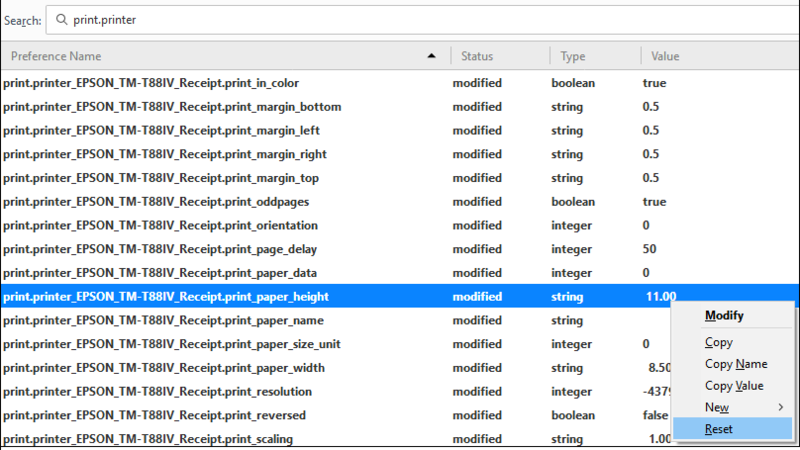 Right-click the number in the Value column for paper_height and in the popup menu, click Reset. You will see the number blank out. 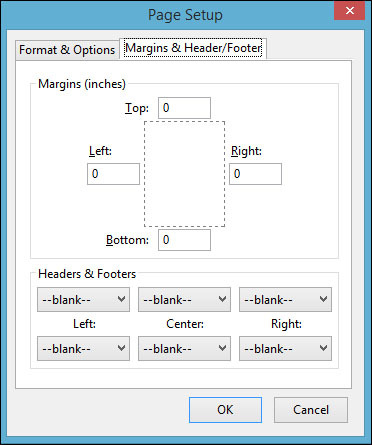 Right-click the number in the Value column for paper_width and in the popup menu, click Reset. You will see the number blank out. 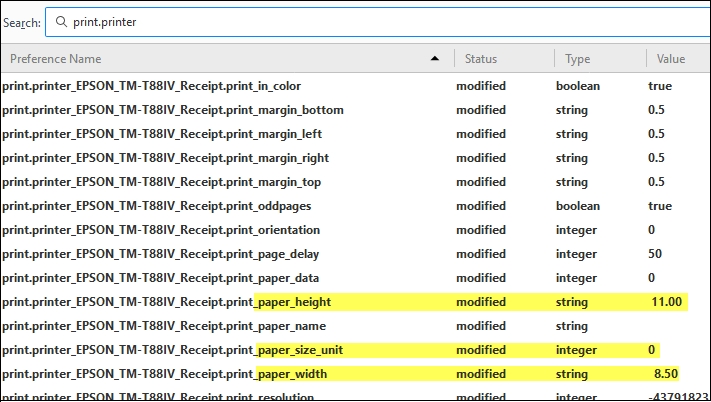 If you need to reset the paper size unit, right-click the number in the Value column for paper_size_unit and in the popup menu, click Reset. You will see the number blank out. Now that everything needed is reset, we need to do a follow up print to update the settings from the printer driver. So go to your Cloud Based Point Of Sale system and print to the exact printer model you just reset. In the Value column, right-click on the word true and in the popup menu, click Toggle. You will see the value change to false.